I am wondering whether you or someone out there might know how to make glutinous rice wine? Thanks. no idea on how to make this. But found it at Cyber Kuali site. Here's the link. Also, dunno where to buy the Yeast ball that it said to be used to ferment the rice. Thank You Gina for your time spent to help me find the recipe. Don't worry I know where to find the yeast to ferment the rice. At the chinece medical shop. I will try it out and hopefully to post some result. Thank U again. thus the reason why people prefer to make this at home. Oh dear!!!! Now knowing this make me even more determine to try to make it by my self!!!! Really we do not know what they are feeding us now a days!!!!. Most of the time, we (my family) would usually eat at home. We find it too much fuss to dress up for one meal. Only now they (my children) would go out with their own peers and have their meals out side. My hubby and I love to try out new dishes that we think is good or authentic. So you can see how inquisitive I am to try out new things or food. Despite getting the recipe from various places/url links, this is something I really have to try to see if it works the way it is mentioned. Apparently NOT! There is much speculation and superstition that goes into making your own wine at home. I tried this on my own for 3 times. Only succeeded the 3rd time. Now I am trying again. this time using just regular rice to make the wine. 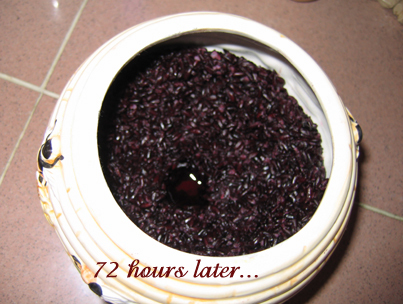 After 72 hours, you should see liquid forming in the centre of the rice. Sieve and strain wine. This is ready for drinking consumption or for cooking. Best to be kept in the fridge. 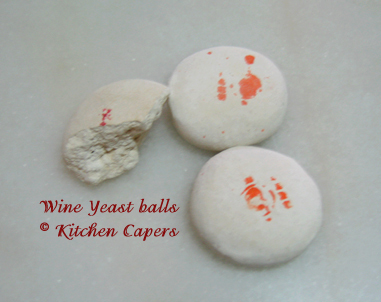 This is how the yeast ball looks like. 1. Wash and soak black glutinous rice overnight. 2. Drain well then steam rice for 30 minutes. 3. After steaming, run it thru tap water to wash again. 4. Let it to drain and cooled. 5. Crush and ground the yeast ball till powdery. 6. Add grounded yeast to rice to toss and mix. 7. Put rice into a porcelain pot that has a cover. 9. Put the porcelain pot in a cooled and dry place, away from direct heat and sunlight. I found out that you can actually use any kind of pot. Not necessarily to be an earthern pot or claypot. Best to use a glass pot with a cover so that you can see the contents and the process of fermentation. Also, I achieved better results in fermentation when I left the pot in my bedroom where it was much cooler than the kitchen. 1. Rice was wet when yeast was added. Though it smells like wine, the wine was murky not clear. 2. Rice was overcooked(too soft). The rice turn black and smelly and no wine was collected. I am still trying now. With 2 new batches of rice. you sound like my mom! when I was making Kueh Bangkit, she told me that its very pan-tang and best to NOT touch the fried flour to mix with coconut milk. but to let it sit for a day. but I couldn't wait so long..so I just go ahead and try it. about the wine..MIL said that sometimes weather temperature plays an important role in fermentation. interesting..my first batch turn yellow : my 2nd batch was a little promising..but smelt like dead carcass. Though there is a tiny bit of wine appearing at the bottom of the pot. but the smell really puts me off. I'm going to try again..using the link you provided..and see what happens. need to go and shop for glutinous rice again. I have an earthern pot(small one) to use for this. costs $10 from NTUC. I just wanted to try it. If I am successful, then I'll ask hubby to go to chinatown with me to cart back a bigger pot. send some over..! very shiok for cooking rice wine chicken..a traditional hakka dish.. I'm curious, what does rice wine taste like? Since u are curious to know what the taste is like, I just went to take a sip at it and it tastes slightly sweet and silghtly sour. I am not very good at describing it but one thing I must say it taste quite nice. Well have a go at it. according to my hubby dearest who has tasted home made wine..he says its a bit like Japanese sake or mirin. I made 2 batches of the wine. With the first, the wine turn murky(milky). So i threw it out. With the 2nd, the rice turn BLACK! and threw it out. On Sunday, we visited MIL and I told her what I did and what happened. And she said that I should buy Black Glutinous Rice to make wine. coz she use that too. Black G.Rice is better and the wine is more fragrant. Yesterday, I visited my aunt(Spice Girl--my cousin's mom)..I told her about this wine and she told me her best friend makes it with ease. I ask her about all the 'pantang' (superstition) about the process of making the wine. She told me its all lies or old wives' tale. As the old people do not handover their culinary skills just like that, thus all the stories of how to make it thrives till today! With that in mind, I now have 2 pots of rice to make wine. Hopefully, this time round, I shall be successful. One pot is Black Glutinous Rice, 2nd pot is the regular white Glutinous Rice. Auntie says to get a glass pot to make the wine..so you can see the progress of the fermentation without opening the cover to peek. Auntie also says that the pot must be kept in a bedroom, away from the kitchen. No wonder MIL said must put under the bed. It has to be away from light(HEAT). As coolness, helps fermentation better. 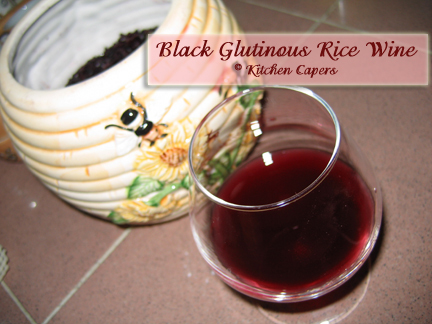 I succeeded in my 3rd batch using the Black Glutinous Rice to make wine. That's according to MIL's recipe. I phoned my mom last night telling her and she told me that there is another way of making it which is the 1 month old wine. The steps involved according to her was very tedious. Much more steps involved than this 72 hours wine. I'll edit the posts and recipe and will moved this topic to Drinks. Thank you for trying it out with me, telephoning me to encourage me. I really appreciated it. No. I should be the one to thank YOU for trying out with me. I really admire your determination and zest. In the meantime I wish you all the best. I will also be looking out for your tips. I will try some more but at a slower pace.